Raphael Armand (the caddie adaptation of Jean Gerard) was the winner of a third annual Looper Loop presented by Robert’s Automotive and held at Knight’s Action Park. It was a grueling, balls to the wall, all out battle which we relished with every lap. 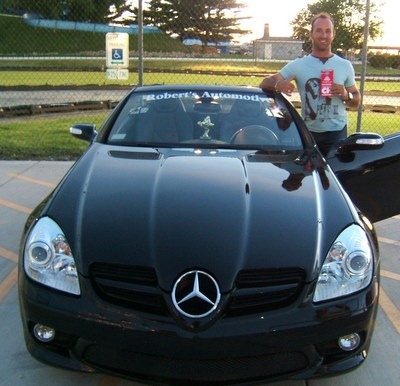 For his efforts and superb racing acumen, Raphael received a $100 gas card, a parking place in the player lot and a Mercedes SLK 350 to occupy it for the week. But all is not well for Monsieur Armand. Effinjeff noted that no one who has ever won the Looper Loop has gone on to win the Sate Farm Classic in a World Cup year. Huh? I had car number six three times in a row. The first two were legitimate races (was pitted into the wall both times) and the third was my birthday present. I had to start at the end of the final heat and was not allowed to win, just act as a blocker. Hmmm, 666. No wonder I got whiplash!